We all have that one special room in the house that we’re over-the-top in love with and think it should be featured on a home design blog. But what if every single space in your home was the envy of your friends, family and strangers abroad? We’ve found 17 outrageously stunning rooms that if designed under one roof would give you the coolest house in the world. 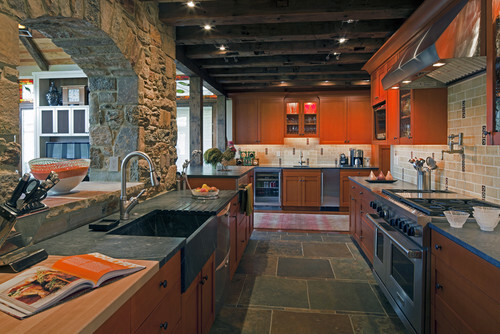 The kitchen is the heart of the home so we’re going to start our home tour here. We covet rooms with a window view of something magnificent, but this enviable kitchen more than satisfies the need for aesthetics with its warm and cozy feel, large tile floor, miles of counter space, commercial range and the archway opening that spills into the living room to keep the home chef connected to the family or dinner guests for the evening. When books are food for your soul, combine your reading passion with your need to eat. This uber cool dining room features gloss black paint that keeps the natural light from the windows flowing through the room. The black and white color scheme gives the book collection the opportunity to come to life as bright accents. 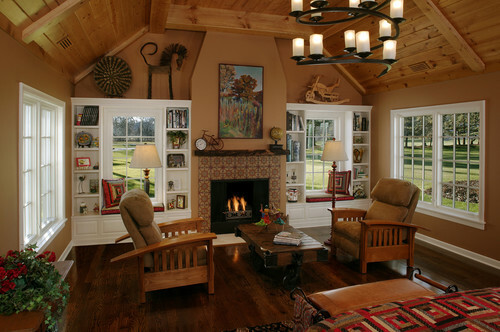 This warm and cozy living room beckons you to step down into its tranquility and recharge. 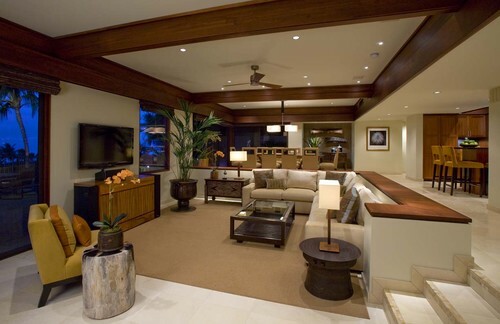 The natural Asian-inspired wood elements, windows with an enchanting tropical view and generous comfortable seating makes this space a haven for relaxation. 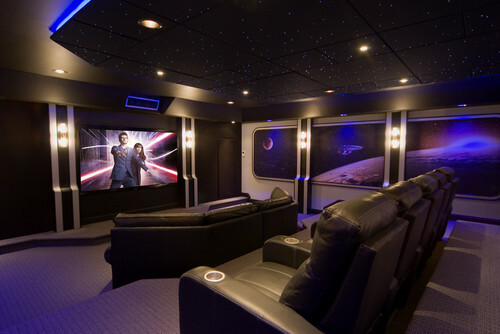 Movie night at your house will be the talk of the block with a home theater room boasting a sizable screen, luxury seating and a fiber-optic starfield overhead. Hook your gaming controls and you’ll have a game room that rivals amusement park attractions. Of all the rooms in your home, your master bedroom should be the one to invite you in to stay awhile. Everything about this irresistible space makes it a special place to rest, relax, enjoy coffee in the early morning, chat by the fire, gaze out the windows, sip wine in the evening and catch up on your journaling. To go along with that idyllic master bedroom, this glamorous master bathroom makes getting up in the morning an exciting endeavor. Who doesn’t want a coffee bar within steps of waking up? You can get your caffeine fix and a bit of breakfast before you have to face the world. Then when it’s time to unwind, simply run a hot bath and sink right in to the oversized tub. Traditional Closet by Washington Interior Designers & Decorators Sroka Design, Inc.
How can a girl get dressed in cramped quarters? This sizable walk-in closet gives you the room to gaze at your clothing and shoe collection. It also delivers a vanity area where you can make sure you’re well-coiffed before walking out. 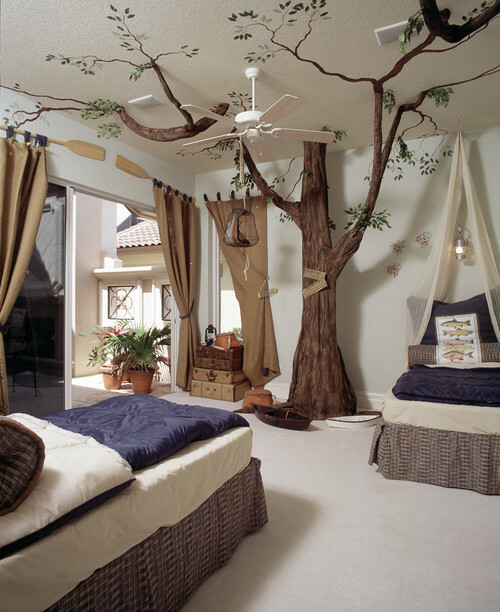 Make your kiddo’s bedroom the coolest place in the house by incorporating nature into the design while providing a comfy reading nook and an opening to the outdoors that entices your child to be inspired. 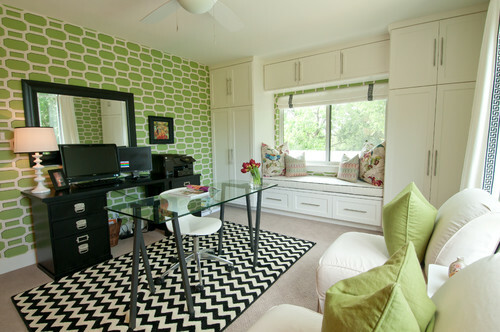 Turn your guest bedroom into a place that your visitors can’t wait to stay in. The gray and white color scheme (along with the lush gray blanket) gives the room a peaceful and calming ambiance. 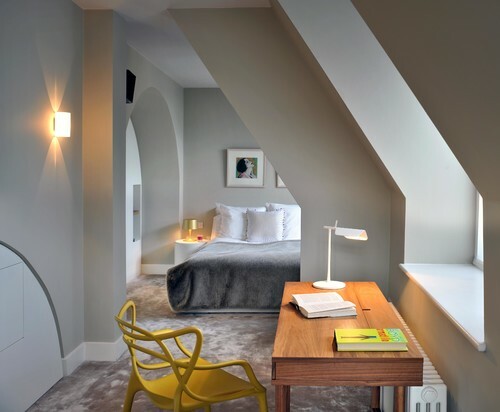 The study, angular walls and archway make this bedroom an inspired space that guests will fondly remember. In addition to the alluring guest bedroom, spoil your guests with a spa-quality bathroom. 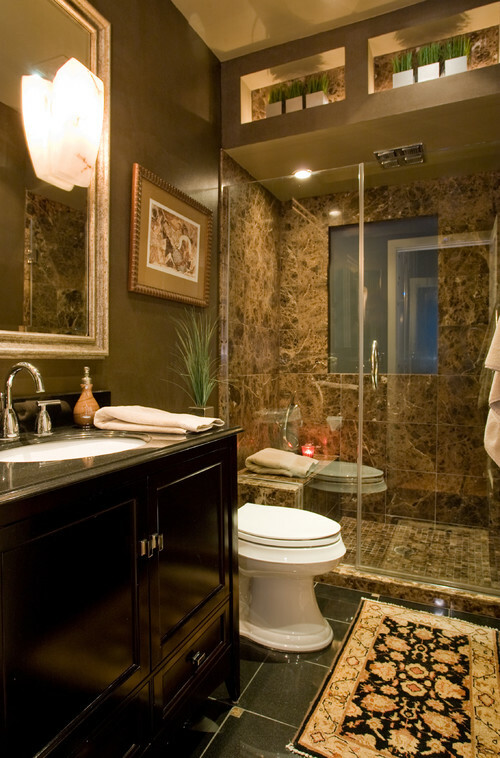 Marble, glass and earth tones will entice your visitors to take a long, carefree shower with lots of space. 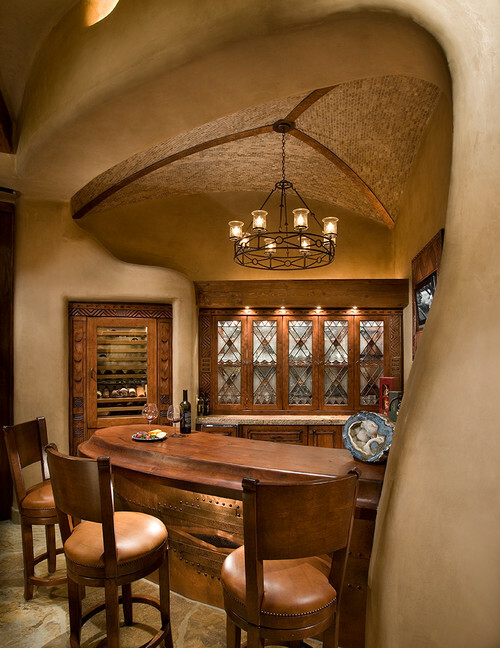 Whether you’re an oenophile or just love to wine and dine with your family and friends, this inviting Mediterranean-style wine cellar may just be the most popular place in your home, if not the neighborhood. Green is full of life and it can effortlessly up the verve factor of your office space. 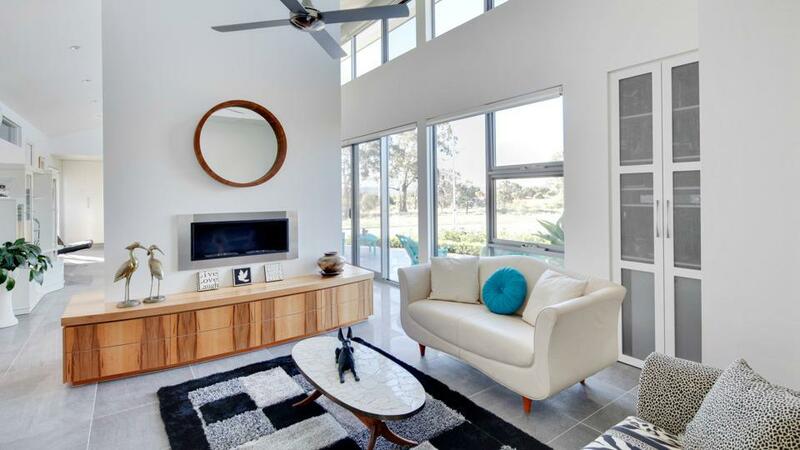 Natural light from the large bay window, bright whites and cushy chairs will have you loving every minute of your work time. 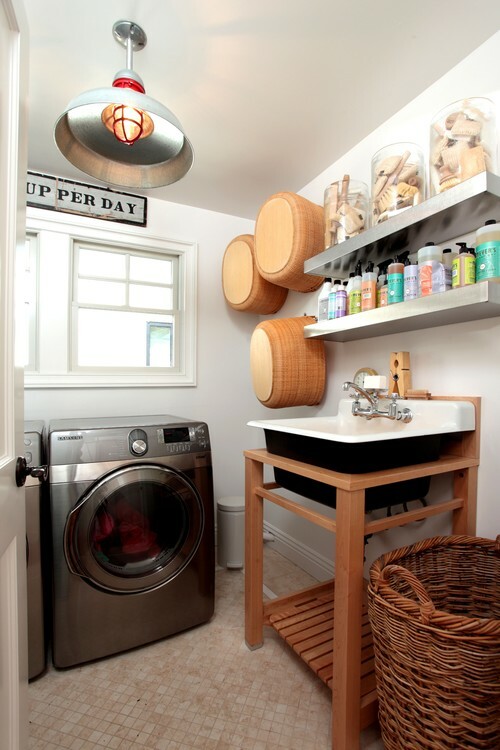 If you loathe doing laundry, this eclectic laundry space may just change your mind. Not only does it have a personality all its own, it also delivers laundry accessories in the most artfully accessible way. 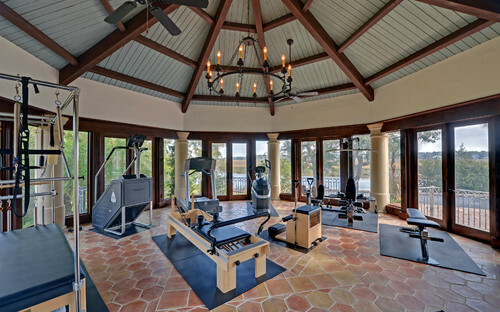 When you don’t want to hassle with a sweaty crowd, bring the gym to you by designing a home gym space that has an open floor plan and considerable natural light from windows that give you a beautiful view. 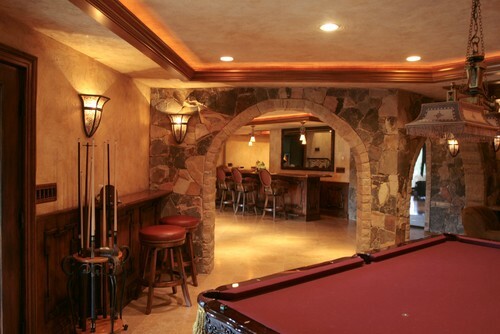 Transform your basement into the hot spot in the house with stonework, stucco walls, wood bar and shelves, and games people play. 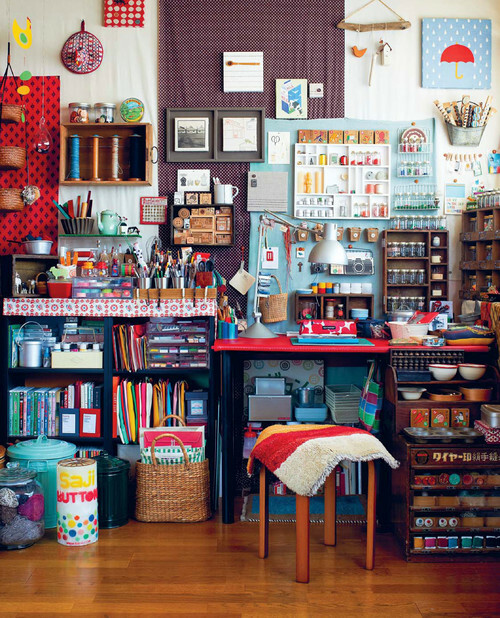 For the DIY goddess who loves color, texture and tools within a finger’s reach, this craft room is an Eden for inspiration and creativity. Denise Richards got it right with this luxe space for her pets. Complete with lush seating, sleeping booths and even a chandelier, this room is bliss for pets and the pet lovers who want to pamper their furry friends.